A true all laser, one-step, no touch laser vision correction procedure. Learn more about Safe Sight TransPRK! EpiLASIK is a safe, surface-based method of laser vision correction to correct your myopia (short-sightedness), astigmatism (san guang), hyperopia (long-sightedness) and presbyopia (lao hua). 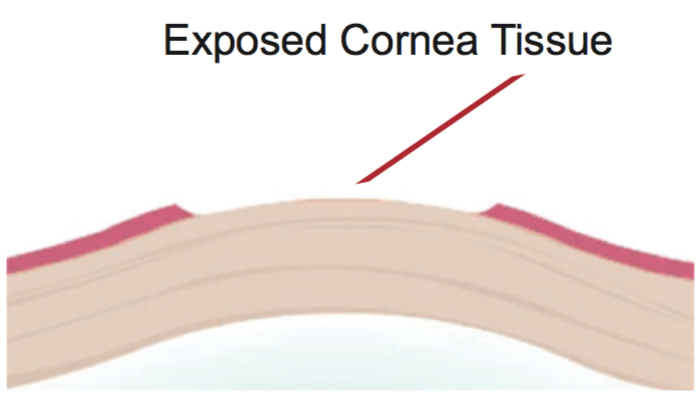 Because there is no cut flap in epiLASIK, the structural integrity of the cornea is preserved and does not weaken the cornea, preventing complications such as flap dislodgement, flap wrinkles and cornea ectasia from taking place. First, a suction ring is placed over the eye to steady it. 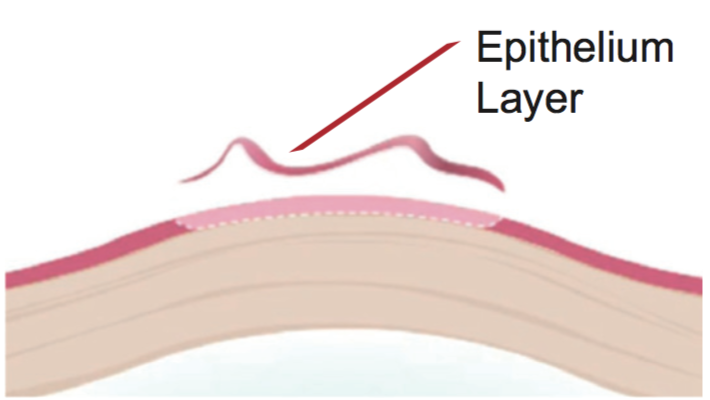 A tissue separator moves gently across the cornea surface to shake off superficial epithelium cells. The epithelium layer is now gently removed. The cornea tissue is exposed, ready for laser sculpting. 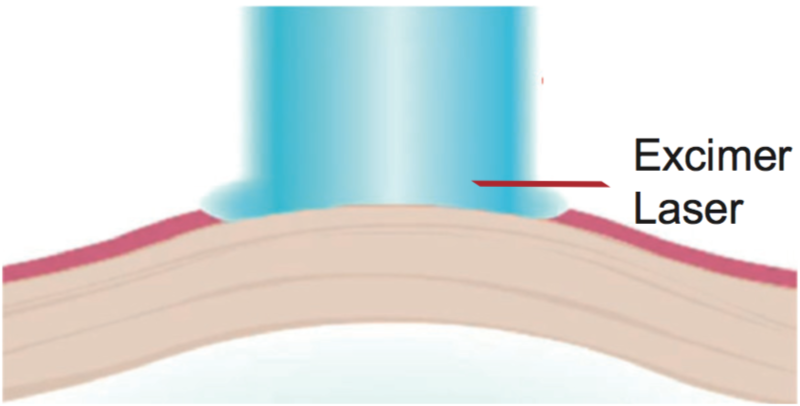 The excimer laser is applied to reshape the cornea curvature. 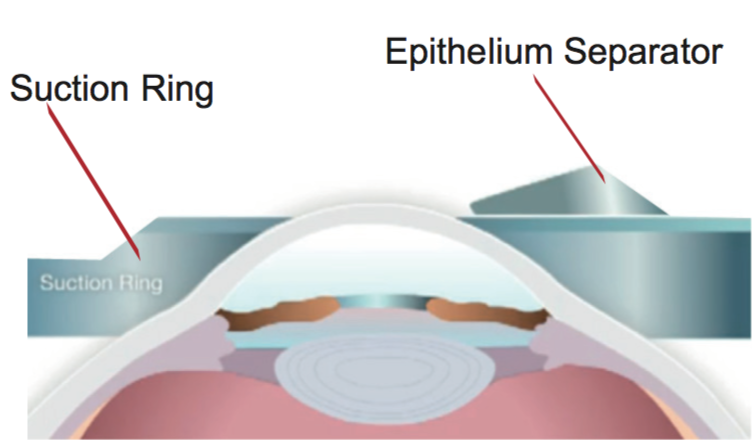 A transparent, high-oxygen content soft contact lens is then placed over the cornea to act as an artificial cornea flap to protect the treated surface while the epithelium cells regenerate. The epithelium cells then take 3-5 days to to heal and regenerate. It is very important to use the eye drops medications prescribed and stay away from strong sunlight for good healing. The high- oxygen permeability contact lens is removed after 5 days. Epi-LASIK does not cut a cornea flap. Epi-LASIK is suitable for active Sportsperson. Your eyes will be safe, even if you participate in vigorous or contact sports about two weeks after surgery. Unlike LASIK, you need not fear cornea flap wrinkles; you need not fear cornea flap dislodgements; you need not have any fear. Epi-LASIK is less likely to cause dry eyes. By cutting a cornea flap, LASIK also cuts cornea nerves and cause dry eyes. If you do not have a dry eye problem, we suggest that you should not create one. Your cornea will not be cut during Epi-LASIK. Epi-LASIK may be a second chance for patients with thin cornea. If you have thin cornea, you may already have been rejected for the LASIK procedure. Epi-LASIK may be your second chance to regain your vision. A big portion of our patients do not have thin cornea, but have already chosen Epi-LASIK. We believe you should too. Epi-LASIK may be a better choice for patients with high myopia. If you have high myopia, much more of your cornea will be used for laser sculpting. With Epi-LASIK, there is no need to create a cornea flap. Therefore, laser sculpting can begin right at the surface of the cornea, leaving the cornea with more cornea tissue after surgery. Epi-LASIK may just be the Ultimate Safe LASIK. Your eyes are probably the most important sensory organ you have. At Clearvision Eye Clinic & LASIK Centre, we advise our patients on all the advantageous and disadvantageous of various Laser Eye Procedures. We believe you should too be advised on choosing a procedure with the most number of advantages relating to the safety and well-being of your eyes – The Clearvision Epi-LASIK procedure.